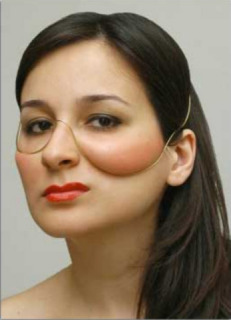 Have you ever wondered why some people go so far with their cosmetic enhancements? It seems that time and time again we see pictures of celebrities who looked much better before they started hitting the ‘spa’ or plastic surgeon’s office on a regular basis. Even worse, sometimes it is just regular people in our lives that we notice these changes on. It can be tough to stay tight lipped in these situations. This is not to say that all cosmetic procedures are bad. Some offer the opportunity to correct an issue that has taken a real toll on a person’s self esteem. It is just that for many the trend has become a bit of an obsession and people come out looking very warped and fake. 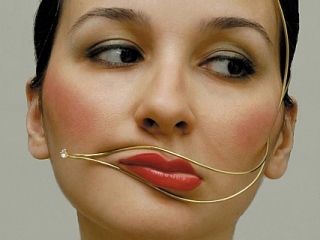 Turkish designer, Burcu Büyükünal, has created a line of facial jewelry to highlight this skewed sense of beauty. The collection features pieces that accentuate different areas of the face in not so flattering ways, much like the effect of many of these procedures. It is an interesting statement to say the least. It looks like it hurts to wear and would be much cooler if it didn't dig into the skin, although that wouldn't have the same effect so then it would just be weird looking instead of making a "statement"
She would wear something like that.